Fox Fine Jewelry was awarded the “Coolest Jeweler” in the nation in 2015 – that’s #1 out of 23,000 jewelers! Locally, they are consistently voted Ventura County’s #1 jeweler. 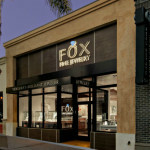 Fox Fine Jewelry is a must see stop in the heart of Ventura’s downtown. In response to the 2017 Thomas Fire, Fox Fine Jewelry gave 600 custom designed diamond necklaces to people whose home was burned or flooded. Through necklace sales, this locally owned jeweler raised $60,000 for those affected by the fire. In addition to unique, beautiful jewelry and repairs, Fox Fine Jewelry’s expertise is custom jewelry. You can work together on a design, and even use your own diamonds and gems! Jewelry is designed on a computer, so you can see computer renders and make changes. Dropping off a repair? All jewelry is photographed, described and insured and all work is done on premises. Owner George Fox, Certified Gemologist and Master Jeweler, is a skilled craftsman and antique restoration expert. Plus, every salesperson is certified in jewelry and gemology by the American Gem Society. Fox Fine Jewelry is also one of Ventura’s leading art galleries, with rotating exhibits by local artists. There’s so much to see, stop by Fox Fine Jewelry!